Zoe is fifteen-year-old cyclist from Orange, California. She is a 2x National Champion after her first road season last year. She focuses mainly on road and track. She started learning how to ride the track about five years ago by going once a week to learn the basic rules and foundation. Zoe decided to race early last year and has loved the sport since. She enjoys training and setting big goals for herself. 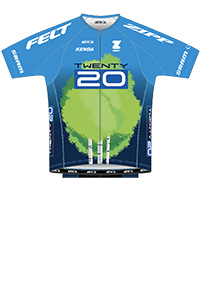 She feels that riding with TWENTY20 helps her gain experience in racing by learning from some of the best elite athletes in the world. What inspired you to start bike racing? I started racing after a long cross-country season, and wanted to start something new. I tried it, really enjoyed riding, and then decided to race. My family, friends, coach, and a lot of others people inspire me everyday, both on and off the bike. The best thing about racing bikes? The best thing about racing bikes is riding around with great people, being able to always set more goals, and traveling. My favorite place I’ve raced so far is Copenhagen, Denmark for the Mini 6-Day. It was such an awesome experience, and I had so much fun time racing Madison with my good friend Makayla. Running with my cross-country teammates. Best advice to give the student-athlete. The most important thing to do is to balance and use your time wisely. It plays a big role in performing well both at school and on the bike. Tell us something that people wouldn't know about you? When I was little, I had four lobes in my right lung, but the surgeon took one out when I was six months old. Explain why it is important for an athlete to pursue education by going on to college after high school. It is so important to pursue education by going on to college after high school because sometimes not everything will go your way, especially in a sport. Going to college means that you’ll have a fallback just in case something doesn’t work out. It’s pretty cool that Ridebiker Alliance supports our team and women’s cycling; while also supporting tons of other teams. I rarely listen to music before a big race, but when I do it’s pretty random.